The Vanilla Orchid was a knit-a-long in the Agnes Kutas Knitwear Group. I honestly hadn't heard of the designer before, but I followed a link and was really impressed by her designs. Unlike some of my other recent KALs, this was not a mystery pattern- The entire pattern and pictures of finished objects were available to see throughout the entire KAL. I wanted a fairly neutral-colored shawl that would go with a lot of my wardrobe, so I decided to use a medium brown for the body and a cream color for the edging. I chose Knitpicks Palette because it’s relatively cheap and comes in a ton of colors. I also really appreciate the fact that Knitpicks writes detailed descriptions of each color, which makes online ordering so much easier. The yarn that I ordered was exactly as I had envisioned it. This was a really enjoyable knit. I learned how to make small cables without a cable needle. I love the leaves throughout the shawl and especially in the border. I’m also very impressed by the stitch definition of the yarn. I love this shawl. I don’t know that I’d knit this particular shawl again (I’ve already done it once! ), but I’d definitely knit more of this designer’s patterns. Want to see what everyone else has accomplished this week? Head on over to Tami's Amis FO Fridays! 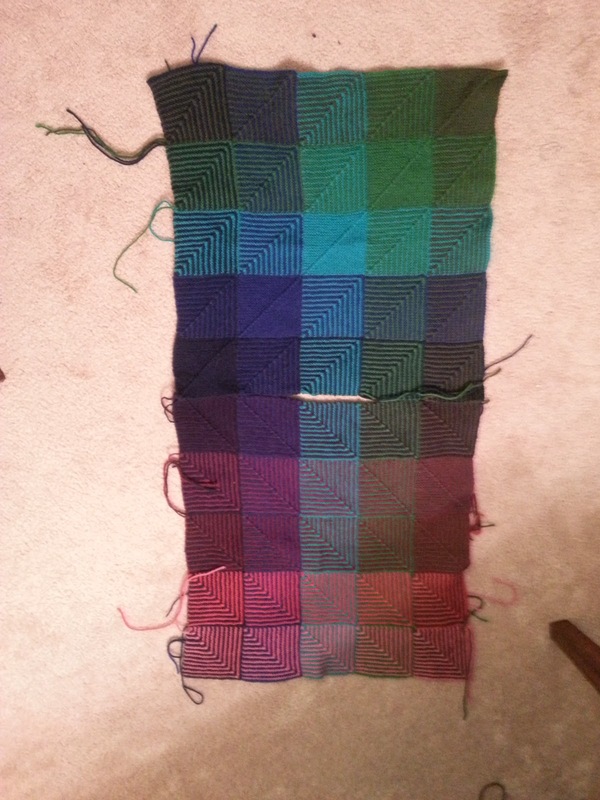 I’ve spend the majority of my knitting time lately working on the Hue Shifts Afghan. I fell in love with this pattern when Knitpicks first released the kit, and I was able to purchase most of the yarn on sale during their Cyber Monday sale. 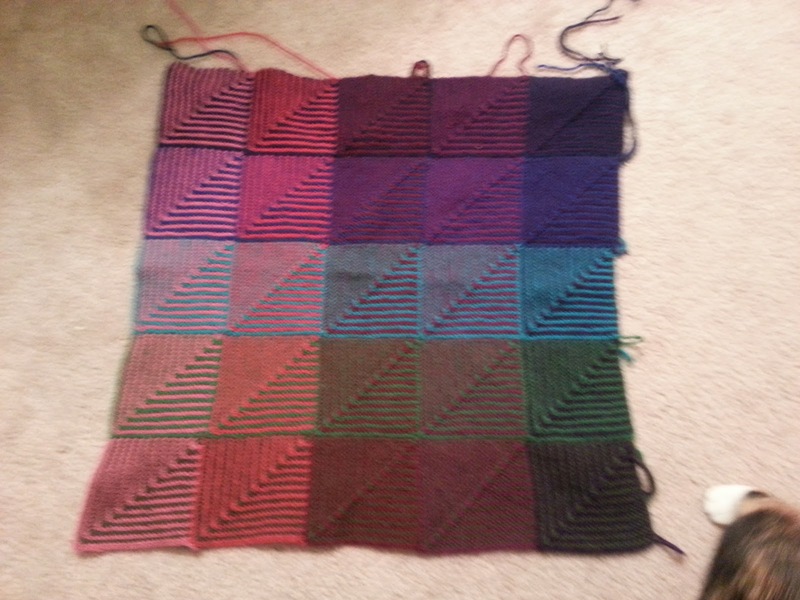 I chose to do the jewel tones version of the afghan, which involves shades of green, blue, purple, red, and pink. I’ve really enjoyed working on this. It is a very simple pattern (all garter stitch! ), but the shifting, changing colors keep my interest. Almost every square requires that you pick up and knit at least 25 stitches (most of them require you do 49), so I’m becoming a pro at the technique. The only thing that I really don’t like about the project is that there are approximately one trillion ends that will need to be woven in when I am finished. The afghan is knit in four sections, then these four sections are seamed together, and a border is knit. So far, I have finished two whole sections and am working on the third, so I feel like I am making fairly good progress. (Yes, those blocks are the same size. It's a weird angle. I was busy trying to keep the cat from tugging on the loose ends). What are you working on this week? Head on over to Tami’s Amis’ Work In Progress Wednesday to check out what everyone else is doing! I meant to write a post about goals for the new year a bit earlier than this- but the cat got sick, then the boyfriend got sick, then I got sick, then my grandmother passed away- 2013 has been really awful so far! So, it is now belatedly that time of year again- the time to start making plans for the new year. I generally like to make some goals for the upcoming year (not “resolutions,” goals. I’m not entirely sure what the difference is, but I like calling them goals and so that’s what I’m sticking with). Entangled Bag. I am so very close to being done with it. I almost finished it in May, but I sewed one of the handles on crookedly. I was so upset (those handles take a long time to sew by hand, especially when you’re carefully shaping vine tendrils!) that I put the whole thing into hibernation. I’m not cringing when I think about the project anymore, so I think it might be time to take it back out- All I have left to do is re-sew one of the vine/handles, sew on the flowers, and line it. All of the knitting parts are actually done- I just need to do the boring finishing stuff. Girl Friday: My Girl Friday is mostly knit- I knit the entire body, laid it out to seam it, and realized it looked kind of big. Since then, I haven’t been able to bring myself to seam it. It may very well not be too big, or it may shrink some in the wash (it’s Berroco Vintage), but I will never know until I seam it up! I need to seam it and knit the shawl collar. 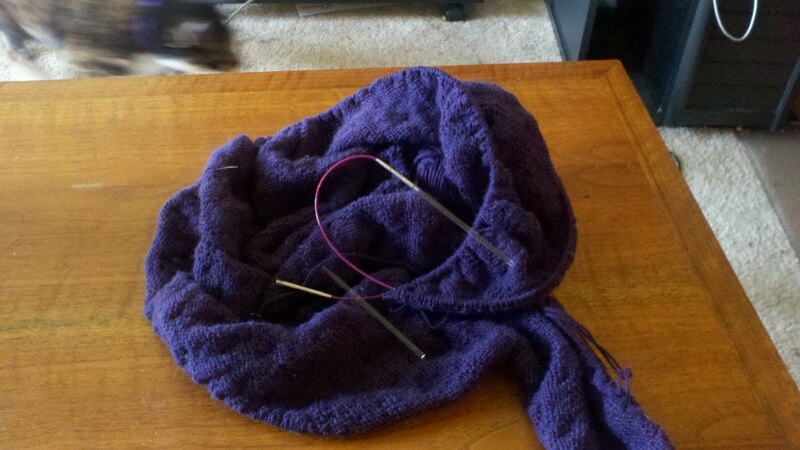 Tussie Mussie: I’ve finished the lower body and most of one sleeve. I quit working on it when I realized that there was no way that I was going to finish it for National Sweater Knitting Month, and decided that I should probably focus on my Christmas knitting. Now that Christmas knitting is done, time to get back to finishing up this sweater. It feels like it might be a bit small, but once again, I won’t know until I finish. Learn to knit colorwork. Colorwork looks really intimidating to me, but I figure that if I can manage complicated lace and cables, surely I can pull off a little fair isle. It’s the next logical step in improving my knitting skills, plus I really want to make some of these stockings. I probably won’t get a whole family’s worth of stockings done this year, but I can at least start learning the skills that I will need to make them. Knit and finish at least two more wearable, well-fitting sweaters. I really want to get better about knitting more sweaters, and making sure that they fit properly. I think I’m going to work on some top down patterns until I get the hang of this knitting to fit thing (nothing like being able to try them on as you go along!). I plan on starting with Dark and Stormy or Francis Revisited. Knit the Hue Shift Afghan. I ordered the yarn and pattern during the Knitpicks Cyber Monday sale. I’ve chosen to do the jewel tones version. This is a really simple pattern, but the color changes add enough interest to hold my attention. 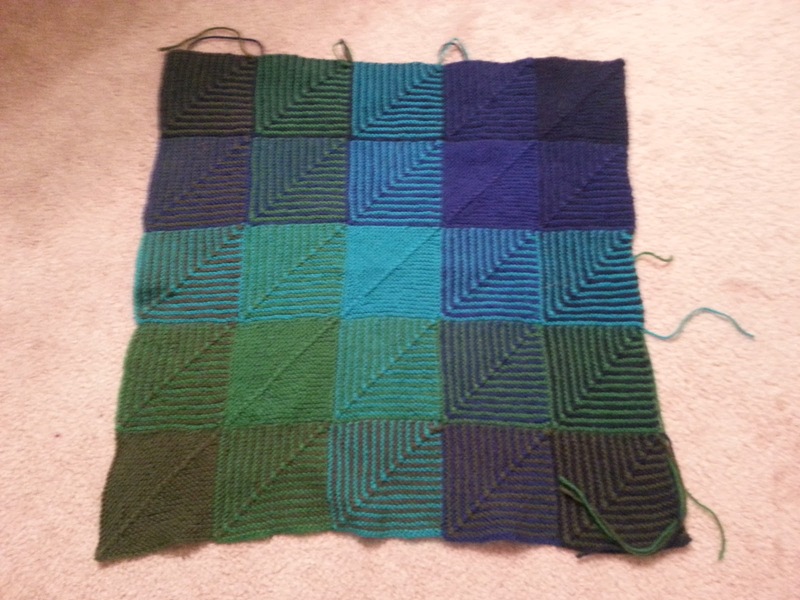 You have to knit the blanket in four quarters, then seam them up and knit a border. Since this didn’t require too much brainpower, it was a great knit while I was sick, and I’ve made a fair amount of progress. I am almost done with the second quarter. Keep an eye out for WIP Wednesday for more information on this one. Exercise at least three to four times a week. I really did try this year- I joined a gym and everything! However, with traffic the way it is around here, getting there was incredibly frustrating and not always possible. I received for the FitDesk for Christmas and am liking it so far- this way, I will be able to work out in the comfort of my home, and can even use my laptop while I exercise. It will be much more difficult to come up with excuses not to work out with this around, especially now that my cough has gone away and I am actually able to work out! Eat out less. I have a bad habit of picking up food on my way home, or for lunch at work. When I get home after work, I’m worn out from work and stressed from my commute, it’s late, and I really don’t want to cook. This results in me either picking something up on the way home or just snacking for dinner, and also means that I rarely have fixed anything for lunch the next day. I want to try to cook dinner at home several times a week. Get a job in my hometown and move back there. This should be good for my mental, physical, and financial health. Cost of living is way cheaper down there. Drivers aren’t nearly as crazy, nor is there nearly as much traffic, which means that I will have the time and energy to cook, exercise, and relax more. Plus, having my parents close by would be great support. The boyfriend and I both want to end up there eventually, so why wait? We’re both applying for jobs down there. Post on this blog at least every other week. *Unfinished objections, for those who don’t know. Still going strong on the Tussie Mussie cardigan here- I've finished the lower part of the body. Just the sleeves, yoke, and button loops to go! I'm a little bit concerned by how much the fabric seems to want to curl, but I'm hoping that blocking will take care of that. 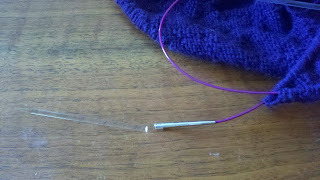 I hit a minor snag when my Knitpicks Zephyr Acrylic Needles broke again. Before knitting with the Zephyr Acrylic needles, I never broke knitting needles while actually knitting with them- sure, I've stepped and sat on a few needles, and they've broken, but that's totally my fault. 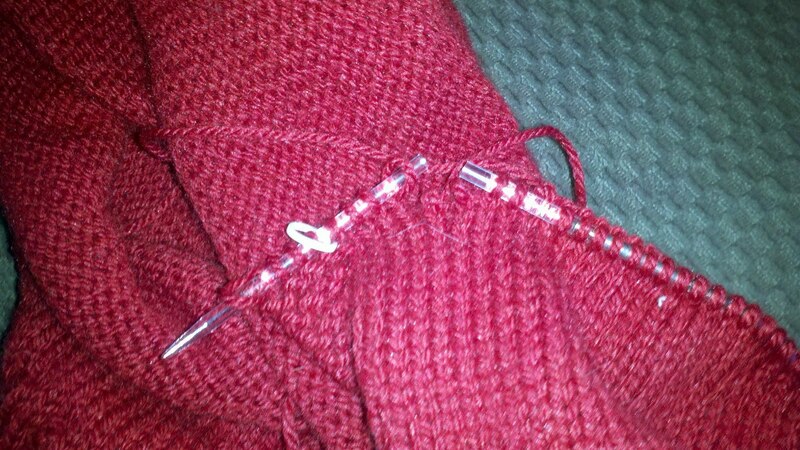 I feel like knitting needles should be able to hold up to someone actually knitting with them. I don't think I'm a particularly tight knitter, but this is the second time I've broken one of these needles in the middle of a row. Luckily, I had an extra pair of tips on hand, but that doesn't make me any less frustrated with the situation. While I'm normally a huge fan of Knitpicks products, I don't think I'll be buying these particular tips again. I'll definitely continue to purchase the Knitpicks Nickle-Plated Needles, though! This year, I’ve decided to take part in NaKniSweMo. This is a take-off from NaNoWriMo (National Novel Writing Month), in which participants attempt to write a 50,000 word novel during the month of November. NaKniSweMo (National Knit a Sweater Month) challenges participants to knit a sweater in one month (which is about 50,000 stitches, give or take). I’ve been meaning to knit and finish a sweater forever, but I need a deadline to really get me amped up to actually finishing it. I’ve chosen to knit the Tussie Mussie sweater for the challenge, a free pattern from Knitty which has been in my queue for just about forever. I cast on in a medium and it was huge, so I’m now trying again in a size small (and I pretty much always wear a size medium or large, so this feels kind of weird to me!) I’m several inches along and have begun the waist decreases. I’ve decided to add a couple of inches in length, as most of the projects on Ravelry either complain about being too short or show a little bit of belly. I’d really like this to be a sweater that I can wear to work, so I need it a bit longer. I’m also going to knit an extra repeat of the nosegay pattern (the flowery stuff), to compensate for the extra length. Although it takes me forever to knit the pattern repeat parts of the sweater, that’s really only a small panel, and I zip through the rest of it (which is knit in reverse stockinette), so the knitting is going fairly quickly. 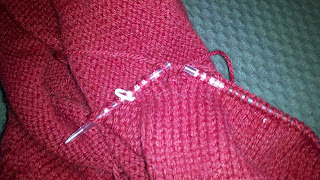 The bobbles really aren’t that hard to do- rather than have to knit a gazillion (okay, more like 6, but still) stitches together like you have to do when making a nupp, the bobbles just require you to turn your work several times. Time consuming but easy. I’ve also been working on the Solar Flare shawl as a knit-a-long in the 2KnitLitChicks Ravelry group. The requirements for the knit-a-long were to knit any shawl in a gradient yarn. There was a pattern designed specifically for this knit-a-long (although you aren’t required to use it! ), and I did try to start it- however, it was very poorly written and confusing (I think the designer was rushing to get it done in time, and didn’t have it test-knit). I realized that I was getting frustrated and not enjoying the knitting at all, so I ripped it out and started this pattern instead. It’s going wonderfully- so much easier! I really like the way the lace is knitting up. To be honest, I’m not entirely sure that I’ll be able to finish both projects this month, but I’m certainly going to try! Let me give you a closer look. See that? That is a broken needle, and it’s totally not my fault. I’ve broken needles before, of course- stepped on them, sat on them, etc. This is the first time, however, that I have had a needle snap in half while I am in the middle of knitting. It’s a Knitpicks Zephyr Acrylic Interchangeable Needle. I haven’t heard of this happening before, so I don’t know whether these types of needles are just weak, whether I got a bad one, or whether I am just an extremely strong knitter. I think I managed to pick up all of the stitches that dropped when it happened, thank goodness. I called Knitpicks, and thanks to their excellent customer support, I have already received a replacement (I didn’t have to send the broken one back, or even show them pictures! And they sent me a whole new pair, rather than just a replacement for the one needle!). I am super impressed with their customer service, but I think that I will stick to ordering their nice, strong nickel-plated needles in the future, rather than the Zephyrs. On the bright side, this means that I had lots of time to focus on my Honey Bunches shawl. It just needs end-weaving and blocking. Since I have both of these projects coming up really soon, I’ve been reluctant to start anything too complicated in the meantime. I’m about two-thirds of the way through the hat from the Knitpicks Luxe Accessories Kit, and I’m really enjoying the feel of the Knitpicks City Tweed Heavyweight. There are some major errors in the pattern though, which has been a little bit frustrating. I also cast on for a pair of toe-up socks in Berroco Sox Metallic. I’m kind of making them up as a I go along, with a little bit of this pattern here, and a little bit of that pattern there. I’m thinking that I may do an afterthought heel (I’ve never done one before! ), but I still have a bit to go before I have to make that decision. I’m just doing a basic stockinette foot for these socks, and will probably just do a ribbed leg- this will be my nice, simple, uncomplicated project for when my brain needs a break from all of the beaded lace in the KALs. What have you been working on this week? Head on over to Tami’s Ami’s WIP Wednesdays to see what everyone else has been working on! I cast on for this shawl before my trip to Orlando, as I thought that it would be excellent travel knitting. It really was, and I got compliments on it from the airline stewardess! The pattern is really easy to understand, but it does get a little bit boring at times. It’s a great pattern to occupy your hands when your mind is doing something else (reading, etc), but not so much if you’re looking for something complicated to concentrate on. One of my favorite things about this pattern was that it had three versions that you could choose from. The first was a regular, written-out version. Most patterns would stop there, but this one also included a printer-friendly version, as well as a detailed version. I chose the detailed version, and it was so easy to follow! Each row was written out, and the pattern also indicated what percentage of the way done with the shawl you were. That was a really nice touch that I especially appreciated. I wish every pattern were written like that! The pattern does not include a chart, but while I normally prefer charted lace, this lace was simple enough to really make any sort of chart unnecessary. I love the feel of working with Malabrigo lace. It is incredibly soft, and the end result feels like wearing a warm cloud. However, it is a huge pain to have to frog- it does not unravel well at all. I’m also a little bit concerned about how the shawl will wear, because this doesn’t strike me as a particularly durable yarn. I love the way that this shawl turned out, especially the ruffles! It’s a very snuggly shawl, and very warm despite being so light-weight. I love curling up with it around my shoulders!